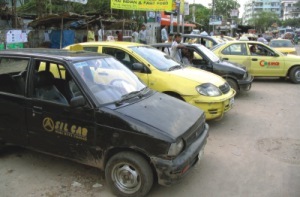 When, about three or four years ago, taxicabs first started running on the streets of Dhaka, many city dwellers were relieved. Finally their commuting troubles would be over. Or so they thought. Since taxicabs hit the already burdened streets of capital, much of the enthusiasm among the commuters along with many of the promises on the part of the cab companies have dwindled. While the addition of taxicabs to the Dhaka traffic has made commuting a little more comfortable and relatively safer (in terms of not getting mugged), the overall standard of the taxi service is still far from satisfactory.